A 200 year old model of the fifth rate frigate Severn, built in Bristol in 1786 and wrecked in Jersey in 1804, has been discovered locked in a cupboard at Berkeley Castle – story here. She spent much of her service in the West Indies, but when wrecked she was the command of one of the most unusual British naval captains of the Napoleonic Wars, Philippe d’Auvergne, the Prince de Bouillon. This entry was posted in Uncategorized and tagged Berkeley Castle, HMS Severn on August 29, 2013 by J D Davies. HMS Cornwall to be scrapped in Swansea – story here. This entry was posted in Uncategorized on August 27, 2013 by J D Davies. Captain, later Admiral, Sir Thomas Williams (1761/2-1841), was a successful frigate captain of the French wars, who was knighted for capturing two French frigates in 1796. He was also married to Jane Austen’s cousin, hence his appearances in the author’s letters and diaries; but the wife in question was killed in 1798 when she was thrown from her gig when it collided with a runaway dray horse. Unfortunately, though, Williams is one of those infuriating people whose origins are very difficult to track down, principally because the combination of names is so common. In this case, the combination suggests that he might well have been Welsh, especially as he was the son of a Captain William Williams RN, and he also became the first captain of the frigate HMS Cambrian, the first warship to bear the name. Some have duly jumped to that conclusion: Thomas Williams was included in a collection of Welsh book plates assembled by Sir Evan Davies Jones (1859-1949), MP for Pembrokeshire, and in 1946 General Sir Henry ap Rhys Price included Williams in an article about ‘Some Famous Welsh Leaders in War’. In fact, research that I’ve undertaken since completing the book suggests that Williams’ immediate antecedents were actually in the Isle of Wight. Indeed, his first wife’s death provides a clue, as her fatal accident took place on the island. William Williams and his wife Elizabeth had at least five children at Ryde, then in the parish of Newchurch, in the 1750s and 1760s: Thomas, who was christened at Ryde on 20 June 1762, Edward, Charles (who probably died young), Anne and Elizabeth. William’s will, made when he was first lieutenant of the Southampton in 1757 and proved over twenty years later, makes the Isle of Wight connection clear, as does the will of his widow Elizabeth from 1805, which mentions all four surviving children. 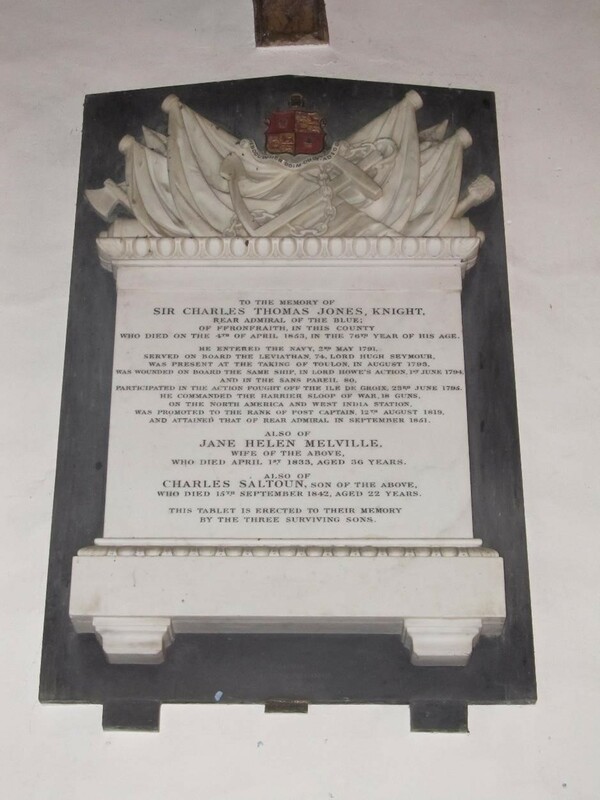 In turn, Anne’s will of 1834 mentions her nephew Edward Richard Williams, the son of Edward, who served as flag captain to his uncle Sir Thomas and also served as captain of HMS Victory. None of this precludes the possibility that William Williams was a Welshman domiciled in the Isle of Wight, but both my own researches and the staff of the Isle of Wight Record Office have failed to turn up any evidence one way or the other. Moreover, as anyone who’s ever done any Welsh genealogical research knows, pinning down one individual with a name like William Williams really is ‘needle in a haystack’ territory! So unless other evidence emerges, Sir Thomas Williams is going to need to remain on the fringes of Welsh naval history, with a very large question mark against his name. This entry was posted in Uncategorized and tagged Jane Austen, Sir Thomas Williams on August 27, 2013 by J D Davies. Today (25 August) marks the anniversary of the death of one of Wales’s most famous seafarers, Sir Henry Morgan, and this was duly marked on social media. Unfortunately, many tweeters chose to describe Llanrumney-born Morgan as a ‘Royal Navy admiral’, apparently relying on his Wikipedia entry, which describes him as such. (To add insult to injury, some tweeters – invariably from across the pond – described him as an ‘English’ Royal Navy admiral…) This might be excusable for those who aren’t expert in the field and have only had time to refer to the most obvious online source, but there’s simply no excuse when the same claim is made in the Twitter feeds of the likes of the National Maritime Museum, Greenwich, which should surely be authoritative. To clarify: Morgan never held a Royal Navy commission of any sort. He was granted a local commission as admiral by Sir Thomas Modyford, governor of Jamaica, in 1667, but this was in command of local privateers and ‘irregulars’, not official naval forces. Samuel Pepys, a near-contemporary of Morgan, was holding high administrative office in the navy throughout the time period in question, and was thus in a much better position to know the truth of the matter than any Wikipedia editor: and Henry Morgan is omitted from Pepys’s definitive list of those who held flag office between the Restoration and the Glorious Revolution. I’ve said very little about Morgan in Britannia’s Dragon, partly because he never served a ‘proper’ navy – the central criterion of the book’s focus – and partly because he has been written about in so much detail elsewhere. Covering Morgan (and other Welsh ‘pirates’ like Bartholomew Roberts) would simply have forced the deletion of less well-known material elsewhere in the book, and that wasn’t something I was prepared to do. Fortunately, my first guest submitter on this blog, Josh Provan of the Adventures in Historyland blog, has solved the problem for me by providing links to his three posts (to date) about Henry Morgan! This entry was posted in Uncategorized and tagged Sir Henry Morgan on August 25, 2013 by J D Davies. The memorial to Jones in Montgomery Parish Church. From Fronfraith, Montgomeryshire, he returned to his home county after his naval service and served as High Sheriff of the county in 1832. This entry was posted in Uncategorized and tagged Charles Thomas Jones, Montgomery on August 23, 2013 by J D Davies. When Britannia’s Dragon had already gone to press, I came across a reference to a memoir that Ellis had written about his time aboard the Monitor. It was too late to do more than work in at the proof stage the brief reference to him having been a trainee teacher; this was a pity, as Ellis’s memoir provides a rare first-hand account of a Welshman’s experiences during the American Civil War at sea. Fortunately, the memoir is freely available online, and can be read here. This entry was posted in Uncategorized and tagged civil war, USS Monitor on August 21, 2013 by J D Davies.